There are two types of Bruce Springsteen fans who have been rocked by a live E Street Band show. Those who caught the band on the Darkness 78/79 tour, and those who wish they could have. 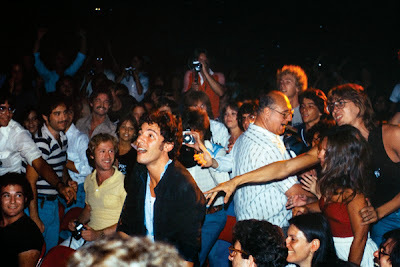 So legendary are those 115 concerts from May 1978 to January 1979, and so pivotal was the period in Springsteen’s music career that books, album re-releases, outtakes and documentaries have all delved into the Darkness-era in recent years. Photographer and Springsteen-book author Lawrence Kirsch’s limited edition book The Light In Darkness is one that puts the fans and the incredible impact of Springsteen’s fourth album centre stage. Recalling details of how they ended up in the audience for one – or several – shows, every stop of the tour is covered through the personal memories of a fan. With more than 100 stories, common themes run throughout – how they discovered Springsteen, how many didn’t appreciate Darkness upon first listen only to later find it an influential favourite, and how seeing the band live changed their life. These tales are joined by more than 200 fantastic photographs from the shows that provide a glimpse into everything about the experience of the tour – from the style and intensity to the expressions of everyone in the band. Something that could be taken for granted today with the abundance of Springsteen fans’ blogs, such as this one, that seek to do the same thing through recaps of a show and photos from a phone snapped from the pit. In a world dominated by comprehensive online resources easily detailing Springsteen’s concerts and shows in minute, visual detail, one of the most impressive things about this book is how it does the same with great images and props from the era. So when fans recall hearing the ’78 version of Prove It All Night or how they felt when Springsteen broke the established conventions and left the stage to join them during Spirit In The Night, anyone who has been to an E Street Show can relate and picture themselves right there at the show more than three decades earlier. Admittingly while after 50 pages in some of the stories can become tiresome as they repeat the similar tales of discovering Springsteen and seeing their first show. But the impact of the album and the tour itself is never lost. And as the structure uses short stories to follow every concert venue, the book is perfect for casual readers wanting to dip into the legendary shows from time to time, rather than take in the entire tour at once. 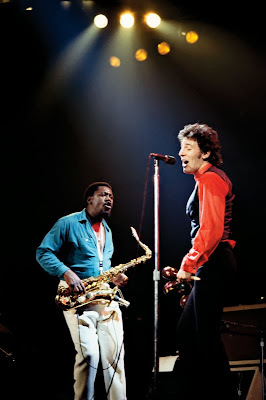 Although focusing on the fans, the chronological visit to the tour also creates a picture of how Springsteen and the band developed surrounding the release of Darkness and the troubles they overcame. What has been frequently touched on in other biographies about Springsteen’s legal battle and the direction he took afterwards are given a new and unique perspective through the eyes of dozens of concert goers instead of a single writer. It is the details surrounding what has become accepted as a crucial time in E Street history that stands The Light In Darkness out amongst the increasingly heavy shelves of Springsteen books currently out there. Not only a worthy companion to documentary The Promise: The Making of Darkness On The Edge Of Town, but also an excellent answer to those who constantly question fans lining up for hours outside venues for the best pit position for every concert they can get to. Part of what makes this book such a fun addition to the expanding collections is how fans share their exclusive part in some of the final shows that the band would play in smaller venues. Offering experiences that many concert-goers today dream of. (The book is not available in shops) But be quick, when I contacted author Lawrence Kirsch for photos to use in this review he informed me there were less than 120 copies left. Plus, until March 3, 2014, those remaining books also come with half-price shipping and the author’s signature upon request. Click here to see Springsteen’s Highway to Hell! And now the transition is complete, from the era of recordings to live performance, from you need to own it to you need to be there. As bad as this audience video is, I’m sure the experience of being there was absolutely delicious. Like the surfers in Malibu always say…YOU SHOULD HAVE BEEN HERE YESTERDAY! You watch the shenanigans of Pink and the dancing fools. You feel the work of Springsteen here. How can he get it so wrong on wax, but so right live? How can he break out of the stultification of playing the same hits to adoring fans to throwing a curve ball so wide, yet over the plate, that he’s got our jaws dropping? This rock and roll is a curious thing. It’s a thread that runs through us that is in danger of dying because those playing it today are too often shoegazers so obscure, with tinny guitars and poor vocals, that only the indoctrinated get it. But in the days of yore, a band started off just left field enough that they earned an initial fan base and the rest of us caught up when they cut their definitive hit. Every band was unique. Not only did every picture tell a story, but everybody’s scrapbook was different. 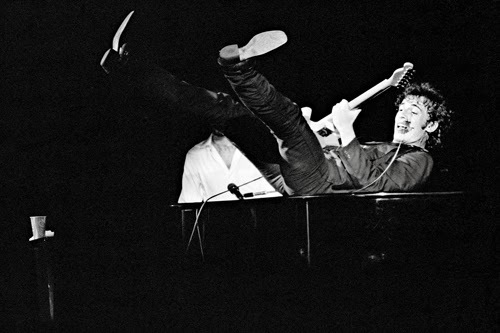 Unlike school, unlike the straight and narrow path, rock and roll was a sui generis adventure wherein you learned how to play, got some gigs, went on the road, and listened to the radio and bought records all the while. To know Bruce Springsteen knows “Highway To Hell” is even more refreshing than knowing he was aware of all those Mitch Ryder killers he used to cover three decades past. Because once upon a time we were all students of the game. And we were all in it together. And the road we were on…WAS THE HIGHWAY TO HELL! We didn’t know where we were going, only that we had to put the pedal to the metal to get there faster. We weren’t planning for our future like Generation Y, worried about our retirement and credit scores, we were into feeding the beast and feeling good. And that’s what you do at the show. It’s not the same thing every night. It’s a living, breathing, enterprise full of surprises. P.S. The highlight, other than the riff, is when Morello and then Lofgren and then Bruce and then Little Steven solo on this rock classic. Because like that old Kiki Dee nugget, they’ve got the music in them, you can feel it, you just want to get closer, and isn’t that the way it’s supposed to be? 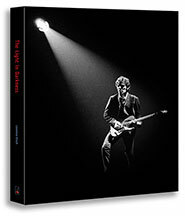 Discover the Limited Edition Bruce Springsteen book, The Light in Darkness. The Light In Darkness is a collector’s edition, we are almost sold out! Buy now and save on shipping until March 3, 2014. Less than 120 copies remain. Many thanks for all the support this past year, and to all the fans who purchased our limited edition Bruce Springsteen book, The Light in Darkness. Wishing you all the best of Health, Happiness and safe Touring for 2014. Bruce Springsteen hasn’t released anything new since Wrecking Ball,(but he has released some old(er) material, Dream Baby Dream, video version, and we can expect High Hopes in January, so you may want to grab a copy of Long Distance Salvation, the Nebraska tribute album featuring acts like Joe Pug, Spirit Family Reunion, David Wax and Kingsley Flood. For 15 bucks you get the limited-edition colored vinyl(sorry, sold out) and, since all proceeds benefit Project Bread, a warm, fuzzy feeling inside. Five bucks will get you the mp3. And for another option, there’s also Nils Lofgren’s exquisite recent disc, Old School — which, given the title, would be appropriately purchased on vinyl. No Springsteen fan worth his or her salt would be caught without Bruce, the much-heralded bio from Peter Ames Carlin — that’s a no-brainer this holiday season for the Bruce Tramp on your list, if they don’t have it already. But there are plenty of other Bruce book options, including Marc Dolan’s Bruce Springsteen and the Promise of Rock ‘n’ Roll, which features some hearty analysis of the various phases of Springsteen’s career; Springsteen FAQ by John D. Luerssen, a veritable Springsteen encyclopedia that covers his life and career in short, digestable chunks (much like your Thanksgiving dinner) and The Light in Darkness, Lawrence Kirsch’s collection of fan tributes and amazing photos from the Darkness era, which only has a few copies left available in its limited run. (Save on Shipping Here: The Light in Darkness) And we of course recommend our very own Glory Days: Springsteen’s Greatest Albums — granted it’s hard to wrap because it’s an eBook, but you can always get it as a $2.99 treat yourself. You can’t go wrong with a Springsteen painting. Or maybe you can. But we prefer photographic imagery for our walls, visit RoccosPhototavern.com, featuring some of the best Springsteen concert shots this side of the Mississippi. At $600-$700, a ’50s-era Fender Telecaster guitar like Bruce’s most famous axe might be a bit pricey unless you really, really like the person. But if you only kind of like the person, for $37 you can pick him or her up a Hohner 1896 Marine Band Harmonica like the one Springsteen’s been known to pull out of his back pocket from time to time. “The Promise: The Darkness on the Edge of Town Story” is a killer 3 CD/3 DVD package that includes a remastered CD of Springsteen’s 1978 masterwork, two albums of previously unreleased tracks, six hours of studio and concert footage, plus an 80-page facsimile copy of the songwriter’s personal notebooks from the time, filled with handwritten lyrics and more. Probably the Springsteen fan on your holiday list already has that set, or you’re not ready to spring the cash. Or maybe you just want to take your favorite Springsteen fan by surprise with something else. In that case, check out “The Light in Darkness,” a large format paperback book of great photos and concert reminiscences that covers the next chapter in that particularly fertile period of Springsteen history. “The Light in Darkness” is a great fan-focused souvenir of that Springsteen tour, which ran from May 1978 through January 1979. Publisher Lawrence Kirsch, who’s clearly as much a fan as a business man, solicited stories from the fans in the crowd and then combined their impassioned tales with over 200+ classic photographs from the tour, showing Springsteen and the band in all their intense and sometimes goofy glory, proving it all night, every night. The book is only available on-line for purchase(Not sold in stores), where you’ll also find a treasure trove of Springsteen material, including a photo gallery that gives a taste of the book’s great shots. 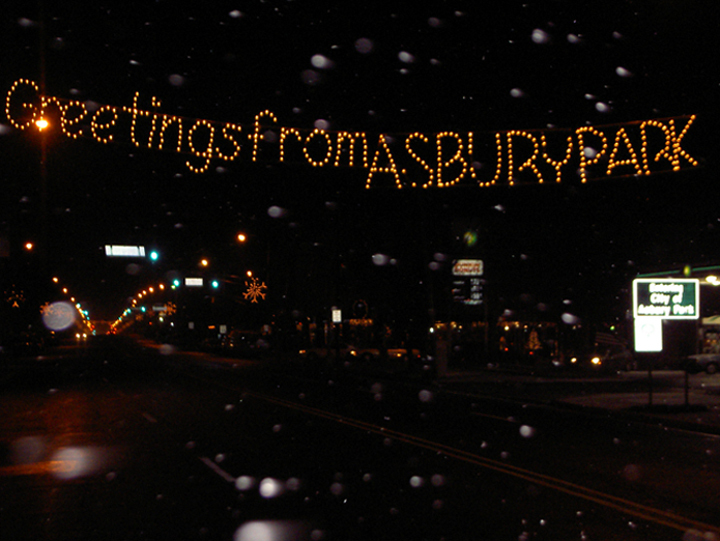 Celebrate the 2014 Holiday Season with Bruce Springsteen. 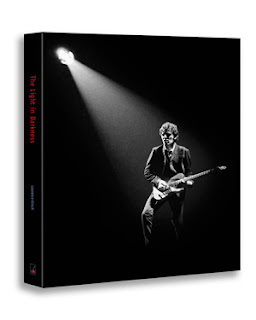 Discover the Limited Edition Bruce Springsteen book, The Light in Darkness. The Light In Darkness is a collector’s edition, we are almost sold out! Buy now for Free Shipping! Less than 100 copies remain.